Chicken word of the day: chickens coming home to roost: to experience the consequences of one's behavior. Last week I finished the hugelkulture bed. It's going to be our permanent asparagus patch. 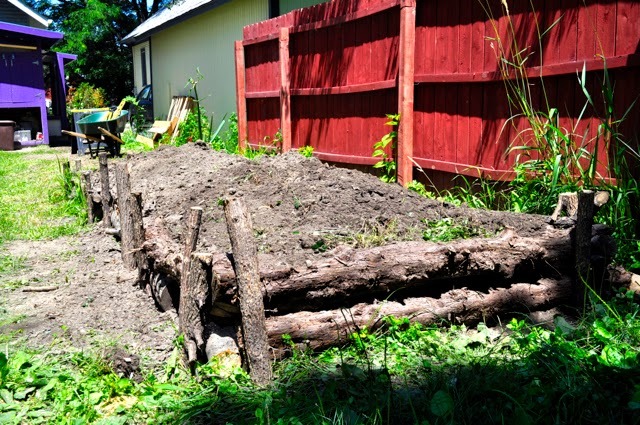 As described earlier, I used logs and branches from trees cut from our back yard fenceline, and buried them with dirt dug from garden paths and around the chicken coop. Unlike the other garden beds Jay and I built, these have a very rustic quality that I rather like. This is a total experiment, I'm hoping the asparagus doesn't mind that the bed will settle as the wood at the bottom begins to rot. It's also nice to finally have some of my gardening projects completed. For this project, we'll have to wait three years to harvest our first asparagus. Bad planning. Big mistake. The conclusion.